What is atelactasis and pneumonia? Atelectasis is a collapse or closure of the lung resulting in imbalance in gas exchange. It is caused due to deflated air sacs that make up the lung called ‘ alveoli’ . Pneumonia is an inflammation of the lung tissue as a result of bacterial, viral or other infection. 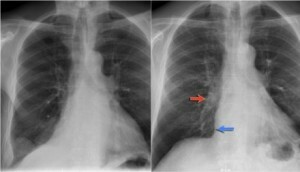 Atelectasis is divided into two types depending on the cause- obstructive and non obstructive. The obstruction may be because of a foreign body, mucous plug or a tumour. It compresses the air sacs causing them to collapse. The commonest cause of atelectasis is post operative, mainly chest and upper abdomen surgery, where administration of anaesthasia causes breathing to be restricted post surgery. Non obstructive causes are when suction is done in which along with sputum, even air is withdrawn from the lungs. Smokers and elderly are at increased risk of developing atelectasis. Loss of surfactant is another reason for atelectasis. Surfactant is a fluid present in between the air that helps reduce the surface tension between the air sacs and keeps them patent. Pneumonia is caused either by external or internal factors. External factors include bacteria, viruses, inhalation of harmful chemicals or trauma to the chest wall. If pneumonia is acquired within 48 hours of admission in the hospital, it is called hospital- acquired pneumonia. Internal factors are those caused by patient themselves like if a person is unable to clear his oral secretion due to improper coughing and swallowing mechanism, which may result in a condition called aspiration pneumonia. Poor dental hygiene is another condition which predisposes the spread of infection. Atelectasis may have no signs and symptoms or it may cause sudden onset of cough, fever, fast and shallow breathing. Symptoms of pneumonia are cough with sputum, fever with chills, shortness of breath, headache, fatigue, difficulty in breathing, chest pain and other nonspecific symptoms like abdominal pain, nausea, vomiting, altered orientation, weight loss. Diagnosis of atelectasis is done by X-Ray Chest, arterial blood gases analysis and a CT scan. Pneumonia is diagnosed using X-Ray chest, culture of sputum and blood tests like Complete Blood Count with differential count, arterial blood gases, C- reactive protein, Electrolytes, BUN, Creatinine and Blood Glucose levels. Treatment of atelectasis depends on the cause. One should quit smoking. If its post surgical, breathing exercises are taught to the patient. Ambulation is recommended to improve breathing and cause lung inflation.Surgical removal of tumour and taking antibiotics if there is infection are the mainstay of treatment. Using CPAP i.e. continuous positive airway pressure is useful too. If the cause is blockage, it has to be cleared either by coughing or suction or by a procedure called bronchoscopy. While treating the patient of pneumonia history should include occupational exposure, environmental exposure, exposure to animals, aspiration risk, host factors and symptoms. Antibiotic therapy is the mainstay of treatment depending on the causative agent found in the disease. Simple rest and maintaining the fluid balance of the body is necessary. Incase symptoms worsen, early admission to the hospital should be done. Atelectasis means a complete closure of air sacs within the lungs due to reduction in pressure in it either from a foreign body, mucous or tumour. It is mostly seen post operatively. Smokers should strictly quit smoking to reduce chances of atelectasis. There are usually no signs and symptoms seen till the disease progresses. Inflammation of the lung due to an infection is called as pneumonia. It is caused by infection from within or outside the body in response of which the lung inflames. One experiences cough, fever, fatigue and shortness of breath. It is the disease of developing countries affecting 450 million people around the globe. rachita. "Difference between Atelectasis and Pneumonia." DifferenceBetween.net. May 23, 2014 < http://www.differencebetween.net/science/health/difference-between-atelectasis-and-pneumonia/ >.